"Because the unaware are unaware, that they are unaware." be called. The program also included plans, now largely forgotten, for what was called "Projekt 'A'"
that would continue on to carry out an attack against a target along the eastern coast of the United States. Hitler and his close associates referred to the plane as the "Amerikabomber." 1933-1945 , an obscure single-volume encyclopedia, long out of print, devoted to airplanes of the Nazi period. expected to be "recovered"—strongly suggesting that it was intended to be used as a bomb. April 16 and 17, 1945, in a desperate effort to defend Berlin from the advancing Red Army. arms production, recalled in his diary in 1947. It was almost as if he was in a delirium when he described to us how New York would go up in flames. the reflection of the flames would light the skyline against the dark sky. Dieter Wulf is a political scientist and freelance journalist based in Berlin. command, should fall themselves into the wolkenkratzer Manhattans. more desperate", says the historian Ulrich Albrecht. "it concerned thus a retaliation strategy.
" It actually gave plans for the development of an America bomber. New York. The conception of suicide in corroding in airplanes was systematically planned by the Nazis. The pilots should fall themselves into machines full explosive on invader fleets or bridges and destroy these. and Verehrerin Hanna Reitsch let itself be persuaded 1944 for the mechanism of a suicide relay. will for the death flight. Beside the America bomber the most peculiar flight constructions were tried out. "a wolkenkratzer is like the tower of Babel", says Hofmann axe handle. "such a symbol tightens aggressions. 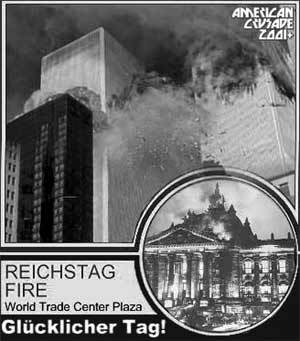 the burning towers was put by other Fanatikern into practice. material from this site for purposes of your own that go beyond 'fair use', you must obtain permission from the copyright owner.